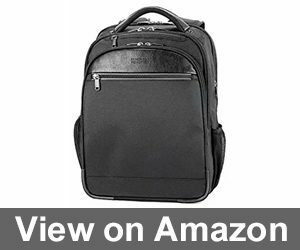 With thousands of professional backpacks currently on the market finding one that works for you and your busy lifestyle can be the last thing you want to do after a long work week. To expedite the process, our testing team has reviewed ten of the most popular business backpacks available. We also drafted a buyer’s guide to assist you in learning all you need to know to select the best model for your needs. Who Should Use a Business Backpack? 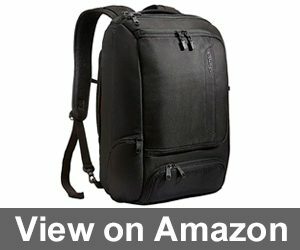 Why Should I Use a Business Backpack? The eBags Professional Slim Laptop Backpack features both a horizontal and vertical trolley handle pass through to make traveling easier. This bag is crafted from a heavier material than traditional backpacks. It can convert from briefcase style to backpack style and includes a removable shock load sternum strap. The eBag Backpack can accommodate a laptop measuring up to 17.5 inches in height and 12.25 inches in width. The straps are comfortable and are easy to adjust. The lining of the bag is brightly colored which is helpful for locating items. The Booq Cobra offers a sleek solution for anyone wanting a professional backpack that will keep their electronics and important items safe. The bag features a padded laptop pocket that accommodates devices up to 15.4 inches. Its light gray fabric is water resistant, so you can feel confident that your electronics will remain unharmed in the event of spills, weather, or any other wet mishaps. 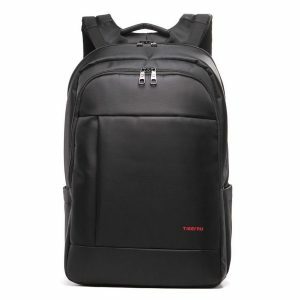 The Cobra Backpack by Booq is fitted with a Terralinq serial number. Terralinq is a special service offered through the Booq company that allows you to register your bag. Booq will contact you if your missing bag was located and get it back to you. The Atlas Laptop Bag created by Everki is the perfect choice for serious traveling professionals. The laptop compartment accommodates devices from a 13-inch netbook to a 17.3-inch laptop. By selecting from three different panels within the laptop slot, you can create a custom fitted home with super strong Velcro slips to keep your devices safe and sound. The Pacsafe Venturesafe X30 is available in three colors: black, Hawaiian blue, and olive green. This lightweight backpack has a built-in rain cover, making it an excellent choice for wetter climates or outdoor activities. Our testing team loved the fact that the bag is so light and easy to wear or carry for longer periods of time. The Pacsafe Venturesafe X30 is equipped with several awesome security features to keep your belongings safer. The backpack is crafted from a special hidden material, eXomesh Slashguard which relies on stainless steel mesh to prevent thieves from slashing the bag and then grabbing at the contacts. This option also contains RFID safe blocking material to protect credit cards and identifications cards from being scanned. The Timbuk2 Command backpack was created with the traveling professional or graduate student in mind. This bag is checkpoint friendly, fully unzipping for faster entry through TSA screening areas. This option has a capacity of 32 liters, and can accommodate a 15-inch laptop and a tablet. This offering from Timbuk2 comes in several professional design schemes: jet black, nautical, surplus, or midway. 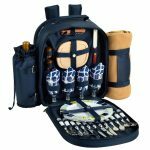 It has two interior pockets for your electronics, two exterior zipping pockets, a water bottle holder, and can be held backpack or briefcase style. A member of our testing team used this bag to get some work done while on a family trip and noted that it worked wonderfully for both business use as well as traveling with children. The Incase Icon Pack features a strong crush resistant shell which allows you to feel confident that your expensive electronics are housed in a protected environment. The backpack has a super soft, velour lining in the pockets designed to hold your phone, tablet, and laptop to protect sensitive screens. It’s also stylish and available in black, red, and gray. The Incase Icon has so many pockets we almost didn’t have enough items to fill it. There are special places for all of your electronics, charging equipment, pens, books, paper, and so much more. The padding in the back of the bag and the shoulder straps provide a higher level of comfort than many similar options. This bag is also less expensive than many other versions, which made us and our wallets happy. The Victorinox Altmont 3.0 is a slim, low profile pack. It can accommodate a 15.6-inch laptop, a tablet or e-reader that is up to 10 inches, and other small items such as pens or earbuds. This bag features a fold over top design with sturdy clips to keep it closed. The Victorinox Altmont 3.0 can expand an additional half inch thanks to its zipper design. This backpack is smaller, lighter, and meant to hold fewer items than some of our other reviewed bags. Our testing team loved the fact that it is easier to carry for petite individuals but noted that it was a bit frustrating that they could not fit more things inside. 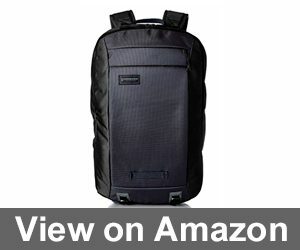 The Kenneth Cole Reaction Ez-Scan Backpack blends luxury and function in one bag. 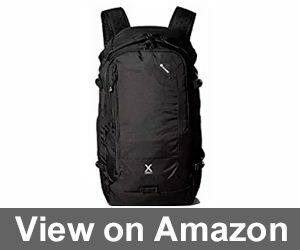 The backpack is constructed from 1680 Denier Durable Ballistic Polyester. Thanks to this heavy-duty fabric, the bag is ready to protect your items for the long haul. The Kenneth Cole Reaction Ez-Scan is perfect for traveling and is checkpoint friendly. The bag held up perfectly during an extended trip and was a breeze to get through airport security. 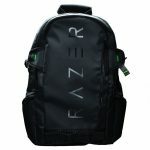 The backpack includes an expansion feature which adds up to 1.75 additional inches for larger items. Our testing team really liked the easy access zipper pocket with a soft lining to stash phones or other important valuables during trips. The Solo Vintage Colombian Leather Laptop Backpack is made from a beautiful full-grain, premium leather and is extremely durable. It can hold a laptop measuring up to 15.6 inches along with many other everyday essentials. The laptop compartment is well padded which will give you peace of mind in knowing your electronics are safe. 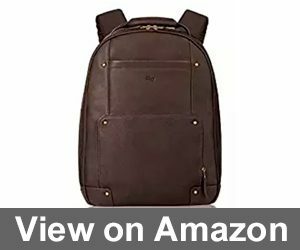 The Solo Vintage Colombian Leather Laptop Backpack is certainly one of the most attractive bags that we reviewed. It’s also very comfortable to carry thanks to padded shoulder straps. The bag holds up perfectly even with everyday use. Our testing team felt that the overall aesthetic design of the bag made it a terrific choice for any professional looking for an alternative to a leather briefcase. The Swiss Gear Travel Gear 1900 is crafted from a 1200 Denier Ballistic Polyester to increase its durability and longevity. This backpack is checkpoint friendly allowing you to zoom through TSA scanning stations. With black fabric that contrasts the red Swiss Gear logo, it is an attractive choice. The Swiss Gear Travel bag can accommodate a laptop measuring up to 17 inches, making it perfect for users of larger electronics. The bag has a carabiner attached to the front to hold your keys as well. It has tons of pockets and spots to store anything you will need at the office or on a trip. The decision to switch from a traditional briefcase or attaché is made simpler by looking at the benefits of using a backpack. They offer a streamlined way to keep all of your important items organized and safe. You can safely store a laptop or tablet, notes, pens, wallet, extra cash, and so much more all in one place. With so many different business backpacks available in a vast array of cool colors, fancy features, and snazzy specifications, finding the best one for your needs can leave you feeling frustrated and exhausted. 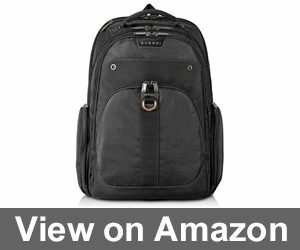 We have compiled this business backpack buyer’s guide to aid you in understanding the ins and outs of this type of bag. Let’s take a better look at the features and details worth exploring. From entry-level workers to chief financial officers, a business backpack can be carried by anyone. As technology and fashion have evolved, the methods to safely and comfortably carry our everyday essentials has also evolved. Backpacks are no longer just for school-aged children as they have been retooled to cater to business professionals in every industry imaginable. If you have ever dumped hot coffee down the front of a cleanly pressed shirt while juggling a briefcase, folders, a phone, and your work ID card, then you may already have an understanding of how useful a backpack can be. Placing your items in a backpack makes carrying everything much easier. You can still drink coffee, open doors, make a phone call, and even eat lunch while using a business backpack. In addition to personal preferences, aesthetic appeal, and fun features, there are a few essential considerations to keep in mind when finding the best business backpack. While we researched and reviewed the top professional backpacks available on the market, we discovered that capacity, comfort, security, and overall design are among the most significant components. Here is an in-depth explanation of these features. Capacity refers to how much the backpack can hold. Your bag needs to be large enough to carry everything that you will need for all of your day to day business tasks. The backpack should have a compartment large enough for your laptop or tablet. Be sure to jot down the dimensions of your laptop or tablet or keep it in mind when reading through product descriptions to ensure it will fit. The bag should also feature separate compartments to store other everyday essentials such as snacks, water, paperwork, and a newspaper or a book. It may also be helpful to select a model that makes it easier to organize small items such as pens, pencils, paperclips, or your phone for example. It is also important that the compartments keep your things safe so opting for a padded laptop compartment or one that allows you to strap it securely in place may be worth looking into as well. One of the most important features of a backpack lies in the comfort you feel wearing it. Laptops, tablets, and everyday essential items can get heavy to carry. A business backpack allows you to evenly distribute the weight across your shoulders and upper back, making it feel lighter than if the same items were in a briefcase. Using a professional backpack also makes your commute to and from work more comfortable. If you are rushing to a meeting, making your way through a subway station or walking across a busy street becomes more comfortable and convenient with a backpack style bag. You can look for versions with extra padding in the shoulder straps or an ergonomic design to increase the comfort level as well. A traditional briefcase often has a combination lock that keeps your sensitive paperwork private. A professional style backpack is no different and should offer a way to keep your laptop, phone, paperwork, sensitive materials, and other belongings perfectly safe and sound. Some models may include a hidden, locking compartment to safeguard items and some include special materials that stop would be thieves from copying files or stealing your personal electronic devices. If security is especially crucial to you, look for backpacks with lockable secret compartments to stole valuables. Since the pocket isn’t readily visible, would be pickpockets won’t know they are there. Some styles of backpacks also offer RFID protection, conceals sensitive electronic information such as passwords or account numbers that people may attempt to steal wirelessly. Many versions are crafted from material that is resistant to tearing or being sashed with a knife, another tactic of thieves and muggers. If the safety of your items is of the utmost importance, make sure to look for these helpful security features. Business backpacks are manufactured in a plethora of sizes, shapes, colors, and designs. Since you will be using the backpack for work, you may wish to opt for an understated, simplistic design in black or grey. There are many sleek and stylish options available that elevate the traditional backpack into a streamlined bag that fits right in to the lifestyle of any CEO. If having a fun pop of color is important to you, you could select a model with a brightly colored interior or select a backpack in your favorite color. A brightly colored bag could be a great ice breaker during meetings. Other design aspects such as a fun print of the shoulder straps can also be a fun touch. Here is a closer examination of some of the features available on many of the professional backpacks currently available on the market. It is also a great idea to take a good look at how the straps are attached to the bag. Well attached straps won’t feel flimsy or like you could potentially tear them off. If you are planning on purchasing a business backpack that has wheels to allow it to roll, the straps should be able to be safely secured while rolling to prevent accidents. The back panel of your new professional backpack should be well padded for comfort. It should also be crafted from a material that allows for ventilation. Your back will thank you after a long and hot summer day. Not all professional backpacks are water or weather resistant. If you live in a wetter climate where it rains often, such as Seattle, this may be a crucial upgrade. Since you will likely use the backpack to carry your personal electronic devices, keeping them dry and safe is an important concern. You can also purchase a separate rain cover for rainy or snowy days if the bag you like does not have this feature. Does your career require you to travel often? If the answer is yes, you may need to go with an option that is checkpoint friendly. A checkpoint friendly backpack allows TSA agents to quickly scan and search your bag. Rolling backpacks that have wheels and a handle are also extremely helpful for individuals that need to travel a lot. Selecting a well-made backpack is imperative. Check for heavy-duty zippers and zipper pulls that will hold up well under constant pulling and tugging. Look for a bag that has excellent stitching with strong thread that isn’t fraying or coming undone to ensure it lasts a long time. 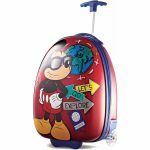 If you will be traveling with the backpack, you want to pick a version that has a trolley handle pass-through or a smaller strap near the top. This feature allows the bag to hang from the smaller loop and it also can allow the handle of a suitcase to pass through which can tether the backpack to your luggage. This is not a necessity but it is a nice feature to have if you are ever late for a connecting flight. For individuals that enjoy being organized, a business backpack with plenty of pockets can be a beautiful thing. From little elastic loops that safely stow away pens to a special spot for your earbuds, there are plenty of features included in this style of bag to allow you to find a place for every belonging. Selecting a model that helps you to be more organized will save you time and frustration. Backpacks have finally graduated to the working force. With streamlined designs and plenty of high tech features and specifications, the use of a business backpack will keep you organized both in and out of the office. There are excellent options perfectly paired to match your business attire while keeping you organized and productive. 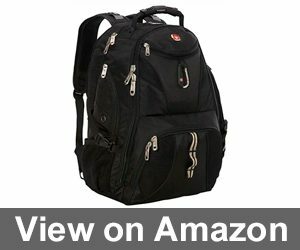 We hope you enjoyed and learned something new from our best business backpacks reviews and buyer’s guide. We would love to hear your thoughts on the best backpack for work. Please leave us a quick note below to tell us about your favorite models and features. After looking at all the backpacks on the market I can’t find anything better than The Solo Vintage Colombian Leather Laptop Backpack. In my opinion, only backpacks like this one may be named for business. 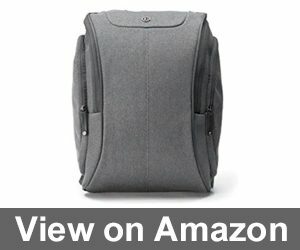 The Kenneth Cole Reaction Ez-Scan Backpack looks best of all, but I’m not sure whether it’s durable. What can you say about this backpack? Is there anyone who’ve tried it? I have this backpack, but I’m not sure I can say anything about its durability just because I’ve been using it for a couple of months. But it looks quite good now. 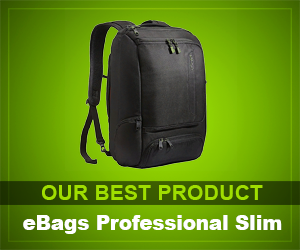 I find the eBags Professional Slim’s size the most convenient for me. It was the most important thing I was looking for, the size matters! Haha but what about other features? Why concentrating on the size is so important for you? Even the Pacsafe Venturesafe X30 isn’t very popular, I find it the best business backpack on the market. I’ve used a lot of them and can say without hesitations that the price is the most suitable for such quality. 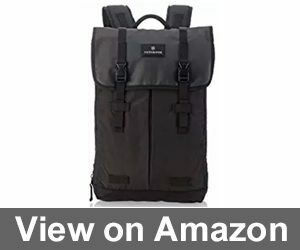 Recommend looking at this backpack everyone who wants a good product which doesn’t cost much. I like the minimalistic design of Everki Atlas. It seems like it’s the most laconic backpack among the represented options. Hope, it’ll be durable. I don’t need many things during a day, that’s why Victorinox Altmont 3.0 was the best option for me. I bought it a few months ago and it still looks good. Hope, it will be the same for a long period of time. I like Pacsafe Venturesafe X30 backpack for the range of colors and weight. I hope, it’ll be durable. I’ve been using the same backpack for a year already and it looks like it was used for a couple of months. I want to recommend this one for everyone who appreciates things which doesn’t cost much but works for a long. I like that The Incase Icon Pack has so many pockets that I can organize all the items and find them easily. Also, the materials are good, so I hope to use this backpack for years. As I’m not the most careful person in the world, there are some problems with Timbuk2 Command. As you can see, this backpack isn’t water-resistant, that’s why a cup of tea that fell out of my hand almost ruined the documents inside the backpack. But the good thing is that it was quite easy to make the backpack clean again. Oh, I understand your situation! But I think it’s a little bit water-resistant as all my documents and things weren’t ruined after a bottle of water. So I still recommend this backpack to everyone who appreciates good quality for an affordable price. I couldn’t think that business backpacks can be so heavy! I bought a new backpack last week and didn’t look at the weight written in a product description. Now I don’t know what to do as it looks great and made from high-quality materials but it’s really too heavy to hold it on a daily basis. I was pleased to know Booq Cobra is water-resistant as sometimes my documents get destroyed by a bottle of water which I didn’t close well or rain ruins not only my look but electronics. The most protective and durable option I’ve ever had is Incase Icon Pack. I like it for the range of colors represented in the shop and that it really costs its price.